Bacteria that associate with plants are diverse in the habitats they occupy, their phylogeny, and their effects on plant and environmental health. The spermosphere, rhizosphere, phyllosphere, vascular tissue and endophytic regions offer distinctive habitats for bacteria. The phylogenetic diversity of bacteria in these habitats extends across the Bacterial and Archaeal Domains; however, bacteria that are known phytosymbionts or phytopathogens are classified into only four Bacterial phyla, the Cyanobacteria, Proteobacteria, Firmicutes, and Actinobacteria. Most plant-associated prokaryotes are commensals that have no detectable effect on plant growth or physiology; these are found primarily on plant surfaces. 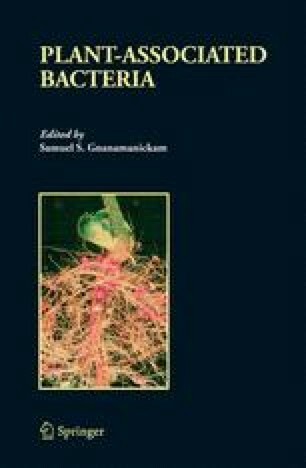 Mutualistic bacteria include the legume symbionts, Frankia, and cyanobacterial symbionts, which form nitrogen-fixing symbioses, as well as associative nitrogen-fixing bacteria and plant growth-promoting rhizobacteria, which can enhance plant growth directly by increasing nutrient availability or producing plant growth-enhancing products, and indirectly by biologically controlling plant diseases. Phytopathogenic bacteria are diverse in the symptoms they induce as well as in their invasion strategies, mechanisms of pathogenesis, culturability, and even genome structure and fluidity. Other organisms that can detrimentally influence plant health are the ice nucleating bacteria, bacteria that overproduce plant growth regulators, and the deleterious rhizobacteria, which can help control weeds. Effects of plant-associated bacteria on environmental health include contributions to the remediation of soilborne pollutants, the decomposition of organic matter, and soil aggregation. Recent advances in genomic sequencing, functional genomics, and microbial ecology are dramatically changing our research approaches to these organisms and the questions we can address about their biology and their interactions with plants.